The interest in Newman is understandable. 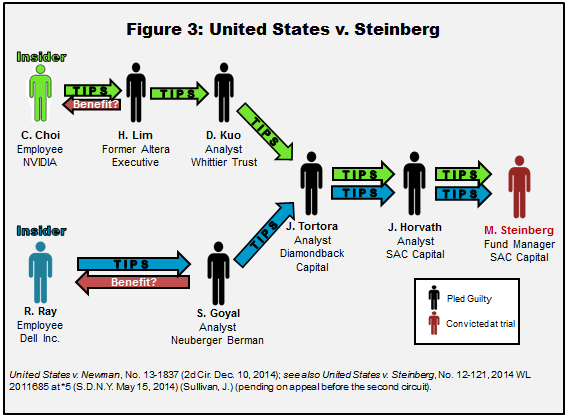 From August 2009 to July 2014, the Manhattan U.S. Attorney charged 85 defendants with insider trading and obtained convictions against all but one.6 If Newman indeed rewrites insider trading law, the decision could, perhaps, threaten the validity of many high-profile convictions and terminate a years-long insider trading crack-down that, until now, showed no signs of slowing. This article briefly explains current federal insider trading law leading up to and including Newman and then assesses Newman’s potential impact on some pending cases. In the United States, no law or regulation expressly prohibits buying or selling stock on the basis of material non-public information. Federal law does prohibit fraud “in connection with the purchase or sale of any security,”7 however, and courts have long considered certain kinds of insider trading to fall within the general ban on securities fraud.8 Thus, insider trading is only illegal when it constitutes fraud. 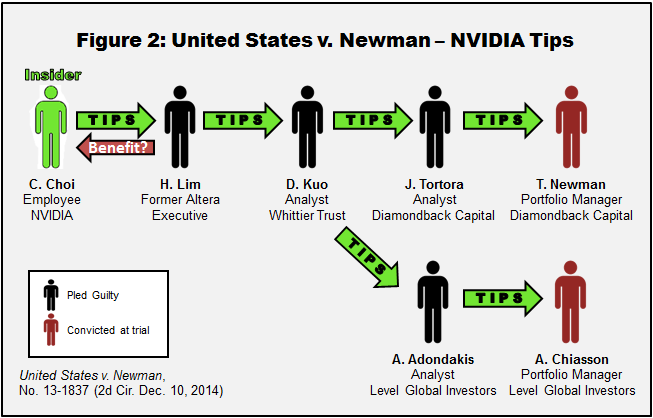 In Newman, two hedge fund portfolio managers were convicted of insider trading and conspiracy for trading Dell and NVIDIA stock on the basis of inside information that the fund managers received through an attenuated chain of downstream tippees several steps removed from the insiders who first leaked the information. Defendants did not dispute receiving information from analysts at their respective hedge funds that may have originated with the alleged insiders, but rather focused at trial on establishing that they were unaware of the circumstances surrounding the insiders’ disclosure to the first tippees. Both defendants were convicted after a six-week trial. On appeal, the fund managers argued: (1) that the trial court had erroneously failed to instruct the jury that defendants could only be found guilty if the Government proved beyond a reasonable doubt that defendants knew the corporate insiders had received personal benefits in exchange for the tips; and (2) that the evidence presented at trial was insufficient to prove that the insiders actually had received personal benefits. The decision heightens the Government’s burden for prosecuting insider trading charges in two respects. First, it holds that the Government must prove that the defendant who allegedly traded on insider information knew that the insider who disclosed the information received a benefit for doing so, even where the defendant had no direct interaction with the insider and received the information indirectly through other tippees. Second, the Court raised the bar for what constitutes a “personal benefit,” ruling that the Government must prove that the insider received more than mere friendship in return for disclosing the confidential information. If the request for en banc hearing is rejected, the Government will have the option of seeking to appeal the decision before the United States Supreme Court. Predictions that Newman will dramatically alter the face of insider trading law may be premature, since much of the ruling’s ultimate significance will inevitably turn on how district courts interpret the reinvigorated standards it sets out. Nonetheless, a review of recent and pending insider trading cases reveals that the new ruling has already been applied in several pending insider trading cases and a review of potential impacts on pending cases nonetheless offers some insight into the post-Newman insider trading landscape. Additionally, some Defendants that pled guilty to insider trading and testified in Newman may now seek to withdraw those guilty pleas, since the Second Circuit determined that based on the Government’s evidence. “It would not be possible . . . for a jury in a criminal trial to find beyond a reasonable doubt that Ray [the same Dell insider who was the source of a tip at issue in Steinberg] received a personal benefit in exchange for the disclosure of insider information.”20 Moreover, the Court explained that the personal benefit element “is not separate,” but instead “is the fiduciary breach that triggers liability.” Accordingly, the reasoning in Newman likewise precludes assigning liability against any defendants arising from tips originating with Ray, or, arguably, with Choi—unless the Government could present additional evidence sufficient to show a personal benefit to those insiders, which appears unlikely here. Another interesting question is whether Newman could have any impact on the corporate criminal charges against the fund itself, SAC Capital Advisors, which pled guilty to charges of securities fraud and wire fraud in November 2013.30 On April 10, 2014, U.S. District Judge Laura Taylor Swain, presiding over the criminal action, approved a joint criminal and civil settlement in which the fund agreed to roughly $1.8 billion in penalties to resolve allegations that it allowed rampant insider trading by its employees. As part of the settlement, S.A.C. admitted insider trading by six employees, including Jon Horvath, the analyst alleged to have passed along the Dell and NVIDIA tips at issue in Steinberg. Other insider trading allegations underlying the fund’s guilty plea do not involve the kind of attenuated series of tippees presented in Newman. Moreover, the S.A.C. entities charged in that case have, by now, long paid the penalties agreed upon in the settlement agreement.24 As a result, it is very unlikely that the Newman could have any practical impact on the finality of that settlement, the terms of which prohibit the S.A.C. funds, now rebranded as Point72 Asset Management, from managing capital for outside investors. The Government’s Indictment in Conradt contains no obvious allegations that the Cravath associate who provided the inside information received any “objective, consequential” personal benefit representing the potential gain of a pecuniary gain in exchange for that disclosure. The day after the Second Circuit’s ruling in Newman, Judge Carter scheduled a status conference for December 18th to determine whether the Second Circuit's ruling affected the guilty pleas of the four former traders and the analysts who admitted to an insider trading scheme.26 After hearing from the parties during the hearing, Judge Carter indicated that he had serious doubts about whether there was a sufficient factual basis for the guilty pleas, but agreed to the Government’s request for several weeks to prepare briefing on the issue seeking to distinguish Conradt from Newman on the basis that the initial tipper in Conradt was not a corporate insider.27 (The trial of the only defendant that had not yet pled guilty was rescheduled until late February). 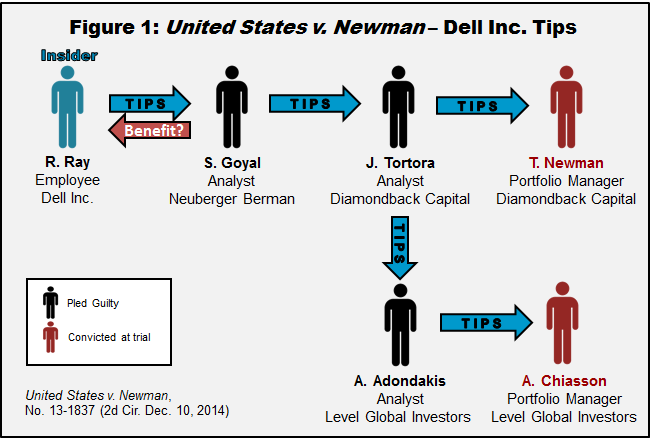 On January 12, 2015, the Government filed a brief supporting the sufficiency of the defendants’ guilty pleas, arguing that the Second Circuit’s holding in Newman was limited to cases brought under the so-called “classical” theory of insider-trading liability — cases in which the tipper is a corporate insider, who owes fiduciary duties to the corporation and its shareholders. 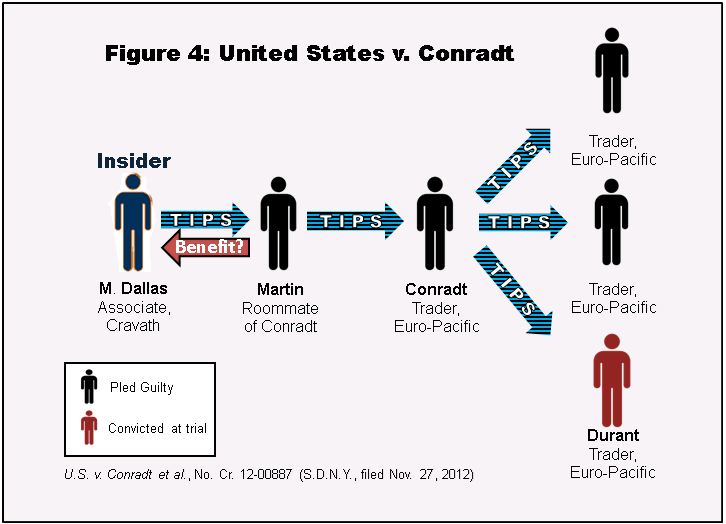 Because Conradt was brought under the “misappropriation” theory of insider trading, in which the tipper is a corporate outsider, who misappropriates confidential information in breach of a fiduciary duty owed to the source of the information, the Government contended, Newman should not apply. Shortly after that ruling, on January 28, 2015, assistant U.S. Attorney Andrew Bauer wrote to the Court requesting permission to drop the charges against all five defendants, conceding that the recent Second Circuit opinion “substantially changed the law pertaining to insider trading.” At a hearing the following day, Bauer told Judge Carter that, in light of “this new, heightened standard under Newman, we do not have the requisite evidence to establish one of the elements of the crime,” referring to the re-invigorated personal benefit requirement. If the Second Circuit’s decision is reversed, the government would consider charging all five defendants again, assuming the statute of limitations has not run out, Bauer said. The Court promptly granted the Government’s request for dismissal without prejudice. In the coming months, numerous other criminal defendants and courts will no doubt continue to examine Newman and its early progeny. Two additional examples that may yield relevant rulings in this area include the cases of Michael Kimelman and Matthew Musante. The first involves a former lawyer and trader with the Galleon Group convicted of insider trading in June 2011 who has already served his sentence but may nevertheless seek to capitalize on Newman to attack his conviction.31 The second example, and perhaps the first outside of New York, involves a defendant residing in Florida who previously pled guilty to insider trading charges brought in the Western District of North Carolina in connection with an alleged insider trading ring.32 Musante’s lawyer recently filed a motion seeking to withdraw Musante’s prior guilty plea, arguing that the attorney’s failure to counsel his client on possible defenses presented by the Second Circuit’s recent landmark ruling constituted ineffective assistance of counsel.33 Whatever the outcome of these defendants’ efforts, in house and outside counsel practicing in this area will need to keep an eye on the continuing developments in insider trading law brought about by the Second Circuit’s landmark ruling. 1United States v. Newman, Nos. 13-1837, 13-1917, --- F.3d ----, 2014 WL 6911278 (2d Cir. Dec. 10, 2014). 2See, e.g., Ben Protess, Appeals Court Deals Setback to Crackdown on Insider Trading, N.Y. TIMES, Dec. 10, 2014; Matthew Goldstein, Some Accused of Insider Trading May Rethink Their Guilty Pleas, N.Y. TIMES (Dec. 11, 2014); Peter Henning, Fallout for the S.E.C. and the Justice Dept. From the Insider Trading Ruling, N.Y. TIMES, Dec. 15, 2014. 3U.S. Attorney’s Office Southern District of New York, Statement of Manhattan U.S. Attorney Preet Bharara On The U.S. Court Of Appeals Second Circuit Decision In U.S. v. Todd Newman And Anthony Chiasson (Dec. 10, 2014). 4Evelyn Cheng, SEC’s White: Insider trading ruling ‘a concern’, CNBC (Dec. 11, 2014). 5See U.S. v. Conradt et al., No. Cr. 12-00887 (S.D.N.Y., filed Nov. 27, 2012); Michael Lipkin, Judge Asks For Newman’s Effect On Insider Trading Pleas, LAW360 (December 11, 2014). 6See Rachel Abrams, Defense Lawyer Ends Preet Bharara’s Streak in Insider Trading Cases, N.Y. TIMES, July 9, 2014; Julia La Roche, Here’s Preet Bharara’s Amazing 79-0 Insider Trading Conviction Score Card, BUSINESS INSIDER, Feb. 6, 2014 (providing a list of convictions through February 2014). 7Section 10(b)(5) of the Securities Act of 1934, 15 U.S.C. § 78j(b), and a related regulation promulgated by the Securities and Exchange Commission (“S.E.C.”), 17 C.F.R. § 240.10b–5. 8See Chiarella v. United States, 445 U.S. 222, 233 (1980). 9Newman, 2014 WL 6911278, at *4 (citations omitted). 10S.E.C. v. Obus, 693 F.3d 276 (2d Cir. 2012) (“[a] second theory, grounded in misappropriation, targets persons who are not corporate insiders but to whom material non-public information has been entrusted in confidence and who breach a fiduciary duty to the source of the information to gain personal profit in the securities market”) (citing United States v. O’Hagan, 521 U.S. 642, 652–53 (1997)). 11See Dirks v. S.E.C., 463 U.S. 646, 650 (1983) (“the transactions of those who knowingly participate with the fiduciary in such a breach are as forbidden as transactions on behalf of the trustee himself. . . . Thus, the tippee’s duty to disclose or abstain is derivative from that of the insider’s duty. . . . The tippee’s obligation has been viewed as arising from his role as a participant after the fact in the insider’s breach of a fiduciary duty’”) (citations omitted). 12In Dirks, for example, a former employee disclosed inside information concerning allegedly fraudulent activity at the company in the hope that Dirks, a tippee, would investigate further and expose the fraud. Id. Because the original tipper did not receive a personal benefit, the Court found no evidence of breach of a fiduciary duty capable of supporting criminal liability for Dirks or the downstream tippees he had informed. Id. at 633 (“Whether disclosure is a breach of duty therefore depends in large part on the purpose of the disclosure. . . . [T]he test is whether the insider personally will benefit, directly or indirectly, from his disclosure.”). 13693 F.3d at 289; see also United States v. Jiau, 734 F.3d 147, 152‐53 (2d Cir. 2013) (articulating substantially the same standard as Obus). 14Compare United States v. Whitman, 904 F. Supp. 2d 363, 370 (S.D.N.Y. 2012) (Rakoff, J.) (in order to be liable, a tippee must know that the tipper received some type of personal benefit) and United States v. Rajaratnam, No. 13‐211 (S.D.N.Y. July 1, 2014) (Buchwald, J.) (dismissed two of the Government’s three insider trading counts on the ground that a reasonable jury could not find that Rajaratnam had knowledge that the tipper received a personal benefits) with United States v. Newman, No. 12‐121, 2013 WL 1943342, at *2 (S.D.N.Y. Dec. 6, 2012) (Sullivan, J.) (interpreting Obus as making “clear that the tipper’s breach of fiduciary duty and receipt of a personal benefit are separate elements and that the tippee need know only of the former”). 15Newman, 2014 WL 6911278, at *1–*3. 16See Christopher Matthews, Review Sought of Appeals-Court Decision in December Limiting Ability to Pursue Cases, THE WALL STREET JOURNAL, Jan. 23, 2015. 17See Patricia Hurtado, SEC Joins U.S. Prosecutors Seeking to Reverse Insider Ruling, BLOOMBERG NEWS, Jan. 26, 2015. 18No. 12‐121, 2014 WL 2011685 at *5 (S.D.N.Y. May 15, 2014) (Sullivan, J.). 19The administrative appeal is S.E.C. Administrative Proceedings No. 3-15925. 20Newman, 2014 WL 6911278, at *11 (emphasis added). 21See United States v. Adondakis, No. 11-cr-00360 (JFK) (S.D.N.Y. Jan. 18, 2012) (Adondakis pled guilty in April 2011 to securities fraud and conspiracy to commit securities fraud in the criminal case and is currently scheduled for sentencing Feb. 3, 2015); United States v. Tortora, No. 11-cr-00430 (WHP) (S.D.N.Y. Jan. 18, 2012) (On Jan. 18, 2012, Jesse Tortora pleaded guilty to conspiracy to commit securities fraud and securities fraud. He is awaiting sentencing); United States v. Lim, No. S3 12 Cr. 121 (RJS) (on Sept. 4, 2012, Lim pleaded guilty to wire fraud and conspiracy to commit securities fraud in the criminal case. The court adjourned Lim’s sentencing in light of his ongoing cooperation); United States v. Newman, Nos. 13-1837, 13-1917 (2d Cir.) (Jon Horvath pled guilty in September 2012 and cooperated at Newman trial; sentencing apparently adjourned in light of cooperation; Danny Kuo pleded guilty in April 2012 to securities fraud and conspiracy to commit securities fraud in the criminal case; he was scheduled to be sentenced on July 1, 2014, but the court adjourned the sentencing). 22A defendant that had pled guilty and been sentenced would likely face a more difficult procedural process for vacating their guilty pleas, which would, most likely, require pursuing a collateral attach of the sentence under 28 U.S.C. 2255. Only one defendant in Newman, Anthony Scolaro, appears to fall into this category, but Mr. Scolaro’s sentence of three years’ probation concludes in 2015. 23The criminal case is United States v. S.A.C. Capital Advisors, L.P., et al., 13 Cr 541 (LTS) in the U.S. District Court for the Southern District of New York (see criminal Indictment, filed July 23, 2013; DOJ press release, Nov. 4, 2013; plea agreement and stipulation of settlement, submitted Nov. 4, 2013). The civil case, also settled via the agreement and stipulation, is United States v. S.A.C. Capital Advisors, L.P., et al., 13 Civ. 5182 (RJS), in the same court. 24The settlement also admitted insider trading by Noah Freeman, Richard Lee, Donald Longeuil, Richard C.B. Lee, and Wesley Wang. 25U.S. v. Conradt et al., No. Cr. 12-00887 (S.D.N.Y., filed Nov. 27, 2012) (see Indictment filed June 2009); see also related SEC civil complaint. 26See Lipkin, note 5, supra. 27Max Stendahl, Newman Ruling Jeopardizes IBM Insider Trading Pleas: Judge, LAW360, December 18, 2014. 28S.E.C. Adm. Proc. File No. 3-16183 (September 30, 2014) (Order Instituting Cease-And Desist Proceedings). 29See James Sterngold, Charges Dropped After Insider-Trading Ruling, WALL STREET JOURNAL, Dec. 15, 2014; Matthew Goldstein, S.E.C. 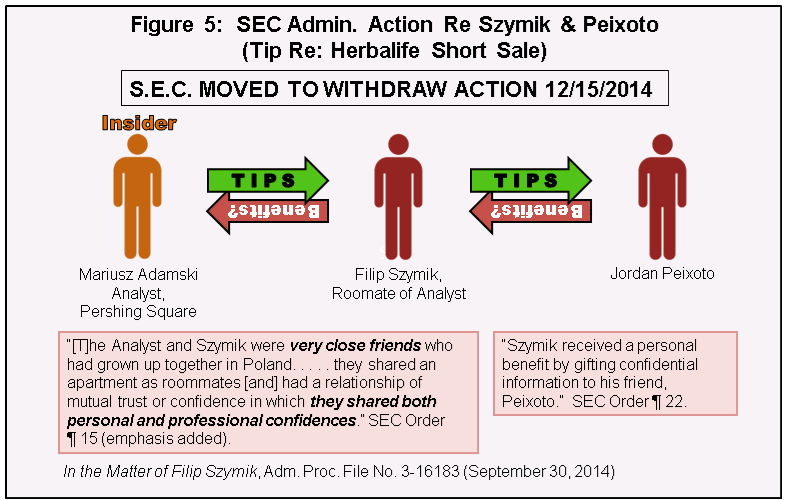 Seeks to Dismiss Insider Trading Lawsuit Involving Herbalife Shares, N.Y. TIMES, Dec. 15, 2014; Matt Levine, Levine on Wall Street: Ruble Trouble and Personal Benefit, BLOOMBERG VIEW, Dec. 16, 2014 (“the Securities and Exchange Commission’s insider trading case against the friend of a roommate of an analyst at Pershing Square for trading on information about Pershing Square’s plans for Herbalife seems to have collapsed, possibly in part because of the Newman decision . . .”). 30See S.E.C. Order, note 35, supra. 31Kimelman, who served 21 months in federal prison, told the New York Times DealBook the day after the Newman ruling that he was discussing with several lawyers whether to file a motion to seek to reopen his conviction. See Matthew Goldstein, Some Accused of Insider Trading May Rethink Their Guilty Pleas, N.Y. TIMES, Dec. 11, 2014. Kimelman, like Newman and Chiasson, was charged as a downstream tippee, and tried before Judge Sullivan. While Kimelman’s case presents a number of similarities to the underlying facts in Newman, Kimelman has already served his sentence, so any challenge to his conviction now would likely have to be pursued through the a special procedure established in 28 U.S.C. § 2255, instead of through the normal appeal process. 32USA v. Musante et al., 12-cr-00386 (W.D. North Carolina, filed Dec. 12, 2012). 33See Musante’s Motion to Withdraw Guilty Plea (filed January 27, 2015).